What can the fashionable set and of course brides planning their wedding expect for next year? Placid Blue, like a picture-perfect, tranquil and reassuring sky, induces a sense of peaceful calmness, while Violet Tulip, a romantic, vintage purple, evokes wistful nostalgia. Similar to the verdant shade of springtime foliage, Hemlock, a summery, ornamental green, provides a decorative touch that’s very different from the greens of recent seasons. Pair any of these versatile pastels with a bolder hue for an au courant look. Sand, a lightly toasted and amiable neutral, conjures images of the beach and the carefree days of summer. Paloma serves as a quintessential neutral, interesting enough to be worn alone or combined with any color for new poise. The palette is brought full circle with Radiant Orchid, a bold counterpart to Violet Tulip, and Dazzling Blue,a scintillating, polar opposite to Placid Blue. Surprisingly, these strong, vibrant colors also pair well across the palette: They are perfect companions to pastels, and add confidence and vivacity when mixed with other bold colors. Thanks to the Pantone Color Institure for this report and if you’re in the planning stage, here are some colors to help you and inspire you. According to the wedding industry, engagement season is “over” and wedding planning is in full swing. If you are one of the new and happily engaged, I’m sure your knee-deep in websites, wedding ‘reality’ t.v. shows’ and perhaps, a few magazines. So let me help make this easier for you by sharing these companies that want to help making your planning easier. Congratulations and let the planning begin. Take your time, do it your way and have fun. When you’re meeting with vendors, everyone will promise you the moon and the stars. Some can deliver. My friends in the industry take pride in NOT making promises they know are impossible. This is one of the main reasons that you should hire a wedding planner – someone to help you navigate these waters. If however you can’t afford it, decide if a friend or family member is going to do it for you, keep this list handy. 1 – How many other weddings are taking place on the same day? This is an important day and why should you share it with other brides. Have you ever seen two brides play nice if they have to share the spotlight or the bathroom? You don’t want your guests going to another party (read: party crasher) and not attending yours. IF there has to be two weddings, ask about sound proofing to avoid clash of the musical titans. 2 – Are there any ‘overtime’ charges? This can run from a few hundred dollars to thousands. Find out and be clear about the time your reception begins and ends. You don’t want the party to get good only to find ‘the parties over’. 3 – Parking near or far? Is there parking on site? This is something you should consider especially for elderly guests. Is there a parking lot near by, is there a parking attendant and if yes, how much extra will this cost? 4 – Bringing it out side? If you are having your wedding at a vineyard, park or outdoor space, are there sound/noise ordinance? It may be possible that the space has to have the ‘fun’ turned off by 11:00pm. Make sure you know this in advance so you can plan for your wedding a bit earlier or for an after-wedding, after-party. 5 – What other options are there for: the bar, caterer, florists? Some venues restrict or won’t allow vendors that they have not used before. If you decide to bring in our own liquor, there may be a corkage fee and/or per person fee. This can cause the cost of your reception to go through the roof. I know a very competent wedding planner who warned the vendors the brides choose to spread the voltage around because the bride didn’t invest in a generator. They had out-door heaters, warming trays, DJ etc…and there simply wasn’t enough power. What happened?? BLACKOUT! Finally, make sure there are elevators or ramps for the elderly or handicapped; enough bathrooms for all (it should equal one stall per 35 guests) and if you decide to make any changes, have them in writing. You get what you do and don’t pay for. Remember that. Let’s get something straight right off the bat….You are NOT Kim Kardashian, Kate Cruise, or any other celebrity that is your favorite (or favorite for the moment) that has gotten married. Weddings – and darn-it…I’m going to say it; something that you may not want to hear or rather, what no wedding planner will dare say…. 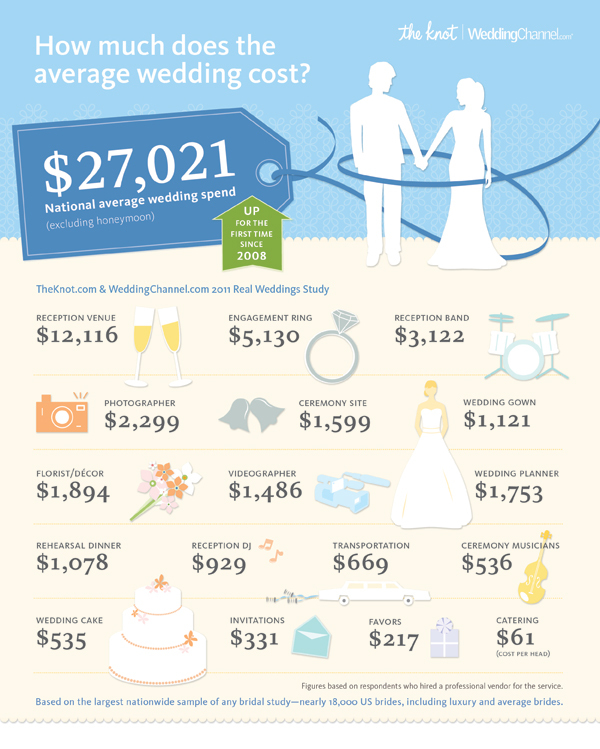 That is reality and just as that is reality, I take issue with some of these numbers as “average” costs of weddings. Fact: A wedding in a major city will cost money. Yes a major city will cost more than a small town, but it’s a major city with more options available. It’s expensive to have a venue, bridal shop etc so you are most times paying for this and not necessarily their talent. Fact: You can have a wedding that is beautiful in NYC for $30,ooo.00. Yes that means your dress, venue, photographer, flowers, wedding planner & suit for your groom. Fact: Not all ‘weddings’ you see on blogs or magazines are real…they are staged by a ‘stylist’ whose job is to convince you that you ‘MUST HAVE XYZ’ or your wedding won’t be beautiful. Don’t’ believe it. Again, you are not a reality ‘star’ and my friends that are celebrities, don’t have million dollar weddings…and they can. Don’t forget why you are getting married in the first place. Fact: Weddings are a $74 billion wedding industry and that means that a lot of publications (not this one because I don’t have advertisers….yet…and when I’m ‘gifted an item, it in no way changes my honest opinion and I post a disclaimer) will only share with you their advertisers and say that they are the best thing since the invention of lace. Not always true. There are more and in some instances better vendors beyond what you see in a magazine…you just have to look. Fact: September, October and November are the new May, June, August. If you want a beautiful wedding without spending the farm, pick another time (especially if a major city) or have a destination wedding. Fact: NYC brides have the highest wedding budget ($65,824) and Virginia brides have the lowest ($14,203). Fact: Brides in Manhattan spend the most on their dresses ($2,403), while North and South Dakotan brides spend the least ($745). Fact: Wedding Size: Iowa brides host the most guests, averaging 215 per wedding, while Hawaii and Nevada have the smallest weddings, with 77 and 63 guest, respectively. Based on average wedding spend in 2011, these are the areas around the US where couples spend the most on their wedding. These stats are provided from the Knot|Wedding Channel. OK, I’m not saying that a lot of these stats are far from off, I’m just one writer who is really tired of couples – no, let’s keep it real, brides thinking that if they don’t keep up with the Kardashians that they are a failure as a bride. You Are NOT! You will be beautiful, your wedding will be amazing and you know what….if you sadly have to divorce…while you’ll miss your ex, the thought of how much money you ‘wasted’ will haunt you more. So keep in mind why you are getting married and believe me….you’re guests will remember how much fun they had and how much in love you are…not how much money you spent. We all know that the economy has changed the way couples look at their wedding and where they choose to spend their hard earned money. It’s not about keeping up with the Duke and Duchess or even the Kardashians. It’s more about, how can I get the most for the money I’m willing to spend? In 2011 the average cost spent on a wedding was $25,631, a 3.4% decrease from the 2010 total of $26,542. While that may not seem like a lot, the cost of wedding had steadily increased over the last decade and this tightening of the belt was felt across the industry. The areas that saw the biggest decrease were rehearsal dinner, engagement announcements, gifts for your bridal party and even wedding bands. However getting a wedding planner, an engagement photo session, the wedding dress (or the number of change dresses you had) and your wedding location saw a large increase in spending. So what does this tell you? All of the things that you see in wedding magazines and blogs, all the stylized photo shoots cost BIG BUCKS and aren’t necessary. Now everyone will have their wedding on TV or can afford to invite 500 or your closest friends to eat drink and watch you get married. More couples are cutting back and I anticipate this trend will continue for the near future. This isn’t to suggest that you can’t have a beautiful wedding if you choose to limit the extras. It simply means have a wedding that will be meaningful to you and your future spouse. There’s nothing stopping you from making due with what you have other than you. Remember in the end, it’s your wedding and just because someone else had a marching band doesn’t mean you have to have an orchestra…unless your wallet is that big. If however it is, please invite me, I give good gifts. All stats were obtained by the Wedding Report and you can see the entire breakdown in their article.